YaLa - Young Leaders Berlin Peace Summit: "The First Middle Eastern Youth Peace Initiative"
The YaLa Peace and Economic Cooperation Initiative is co-developed and organized by YaLa-Young Leaders and the Institute for Cultural Diplomacy (ICD). The aim of the initiative is to create a new vision of peace and cooperation in the Middle East and North Africa (MENA) region in the political, social and economic realms, through the leadership and empowerment of the young generation. The Initiative will promote issues including regional peace (with an emphasis on peace between Palestine and Israel), good governance, human rights & equality, empowerment of youth and women, economic development, education, cultural diplomacy, and relations between government, civil society, and private sector institutions. In addition, the initiative aims to create and fund collaborative youth-directed projects in cooperation with international public and private sectors and regional civil society groups. YaLa-Young Leaders is a Facebook-based movement promoting dialogue and engagement as means to securing a safe, productive, and peaceful Middle East and North Africa region. YaLa was co-founded by the Peres Center for Peace and YaLa Palestine in 2011. With over 130,000 members from across the Arab world, Israel, the Mediterranean and the wider international community (primarily from Egypt, Palestine, Jordan, Algeria, Israel, Turkey, Morocco, Tunisia, Iraq, Libya, Saudi Arabia, Lebanon, the United Arab Emirates, Kuwait, Qatar, Sudan, Syria, and Yemen) YaLa-Young Leaders is the broadest and fastest-growing Middle East peace movement in the world today. The aim of the 2012 Berlin Summit is to produce a detailed "call-to-action" plan on behalf of the YaLa-Young Leaders community that will focus on regional peace and economic development projects for youth. The Summit will be a groundbreaking project: It will be the first peace and economic cooperation initiative to be devised by the young generation, for the young generation of the Middle East and North African region. 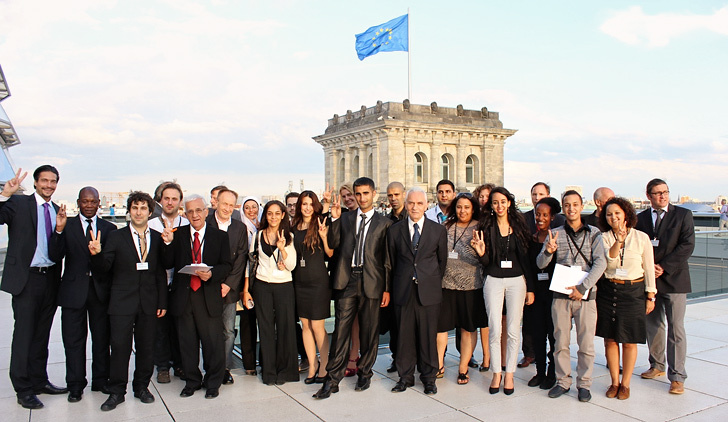 At the 2012 Berlin Summit, taking place on the 25th and 26th of August, fourteen YaLa representatives, coming from 10 countries from the Middle East and North Africa, will execute the drafting of a Peace and Economic Cooperation Initiative Proposal. The aim of the Summit is bring together the young generation of the Middle East and North Africa for a meeting of minds in order to negotiate and develop a joint initiative that creates a vision and platform for cooperation, peace-building and economic development for the region. Concrete projects for the youth of the Middle East and North Africa will be discussed based on executive summaries prepared prior to the Summit in the fields of language, tourism, business, art, music, film, and sports. These projects will be developed in full cooperation with YaLa's landmark program; the YaLa-Young Leaders Online Academy (YLOA). Following the Summit, the fourteen YaLa representatives and additional young leaders will reconvene in Berlin from December 14th-16th, 2012 for another meeting and series of internal negotiations regarding the implementation of the YaLa Project Book, which will be developed and disseminated to the private sector on the basis of Corporate Cultural Diplomacy and Corporate Social Responsibility.